The one chair for all your needs - durability, looks and versatility for anywhere you need a seat. Waterfall seat edge reduced pressure points at the back of the knees for improved circulation. Pneumatic seat height adjustment moves the seat up and down to adapt to several different body types. 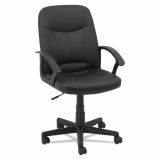 OIF Executive Office Chair, Fixed Arched Arms, Black - The one chair for all your needs - durability, looks and versatility for anywhere you need a seat. Slightly arched loop arms provide the perfect positioning. Waterfall seat edge reduced pressure points at the back of the knees for improved circulation. Pneumatic seat height adjustment moves the seat up and down to adapt to several different body types.